The Mass Additions Create Program (APMACR) is submitted from an Accounts Payable (AP) responsibility. The purpose of the program is to interface the costs of purchased items that meet the criteria to become an asset. It also interfaces adjustments to the invoice cost and discounts taken when the invoice is paid for assets that have already been interfaced. Which type of asset an invoice distribution becomes depends on the natural account segment and the asset category configuration. Any invoice distribution that is charged to an expense account is eligible to be transferred to Fixed Assets (FA) as an expense type asset if the “Track as Asset” option is selected on the distribution line. These expenses are not depreciated in FA, but they are reported as an expense. Capitalized assets will start to depreciate based on the depreciation method rules and the date placed in service. CIP assets do not depreciate until the asset is capitalized and placed into service in FA after they have been transferred. 1. Define the account type of an account in GL. A complete account is set up in this screen. However, for the mass additions process, only the natural account segment is evaluated. You can use the same natural account with different company or cost centers, and they will still be selected as an asset. 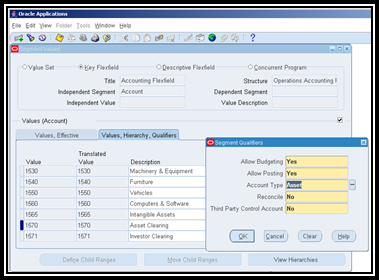 This means that you must set up a different natural account segment for every asset book you use. 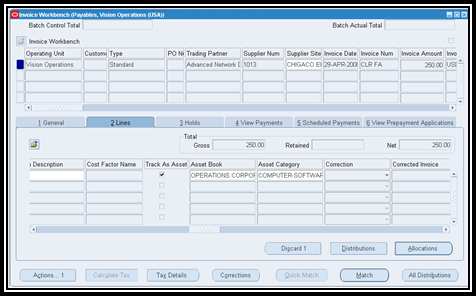 Note: Enter the entire General Ledger Account shows in the asset category setup screen. However, the Mass Additions Create process only looks at the natural account segment of that account. A typical business requirement is to have separate corporate depreciation books for various operating units that are tied to the same GL chart of accounts. To meet this need, the natural account segment must be different for each corporate depreciation book. In the screen shot above, the third segment is the natural account segment, so account 1570 and 1590 are the two natural account segments that the Mass Additions Create Process will use to transfer costs from Payables to the OPS CORP book. Note: In the distributions screen, the Track as Asset field is not displayed by default. It is automatically checked for all asset type accounts and cannot be unchecked. To set the flag for expense type assets, go to the / Folder / Show Field option and elect to display the Track as Asset field. 4. Optionally, enter the Asset Book and Asset Category on the invoice line. If these values are entered on the invoice line, the asset book and asset category will default to the distribution line. When the item is transferred to FA, the distribution amount will default to the asset category and asset book assigned in payables. Note: If the distribution lines are saved before the asset book or asset category is populated on the invoice line, then the distribution line will not have this information copied to the distribution. The asset book can be manually populated at the distribution level, but the asset category will need to be assigned when the mass addition line is prepared. · The invoice is approved. · The invoice line distribution is finally accounted. · The invoice distribution line is charged to an account set up as an asset type account (CIP or capitalized assets) or an expense type account (expensed asset). · If an invoice distribution charge account is an asset type account, then that account must be set up in Fixed Assets on an asset category as either an Asset Clearing Account or a CIP Clearing Account. If it is not set up, the mass additions create process will select the invoice distribution line for evaluation, but it will be rejected by the FA code. At that point, the assets_addition_flag is set to ‘N’ as the line was evaluated, but rejected. · The “Track as Asset” check box is selected. This checkbox is automatically checked if the distribution charge account is an asset type account and cannot be changed. For expense type accounts, this box can be checked or unchecked. For other account types. The “Track as Asset” check box remains greyed out and cannot be selected. · If the invoice line is assigned to a project, it is not a capital project. · In a multiple organizations set up, the Payables operating unit must be tied to the same General Ledger Set of Books as the corporate book. · The user running the mass additions create responsibility must have access to the ledger to be processed. The mass additions create process bases which transactions are sent to FA on the Accounting Class Assignments setup. By default, the following accounting classes will be evaluated to send to FA. Item and accrual invoice distributions will be transferred to FA based on the criteria discussed above. Each line is interfaced as one asset in the NEW queue. The various costs can be merged in the Prepare Mass Additions process, added to an existing asset, or each invoice distribution can be posted as a separate asset. Variance lines (IPV and ERV) lines will have the related_id on the invoice distribution point to its associated item line. Each line is interfaced in the MERGED queue. In other words, the IPV and ERV lines will be added to the costs of the item distribution when they are posted to FA. Discounts are based on the payment accounting and tied back to the invoice distribution through the payment history data. Discounts on payments of assets will be interfaced to FA in the NEW que as adjustments. Discounts should be processed as cost adjustments to the asset. Other non-accrual and non-item lines, e.g. Freight and Miscellaneous lines, if allocated to the item line, will inherit the account of its associated line item. In this case, the charge_applicable_to_dist_id value on the invoice distribution will be populated and the line will be interface to FA along with the parent item line. For example, a PO (accrue on receipt is set to yes in this example) is entered for $500 USD. The po charge account 01-000-1570-0000 is an asset account. When invoiced, the price is $550 US. When the invoice is accounted, an invoice distribution line of $50 difference between the po cost and the invoice cost for the IPV will be created. Account 1570 is an asset type account and is set up as the asset clearing account. For INV1, one item will be transferred to FA with two source lines, totalling $550. For INV2, one item will be transferred to FA with two source lines, totalling $110. For INV3, one item line will be transferred to FA with one source line, totalling $200. Even though the freight line has an asset account, it is not allocated to an item line, so it does not meet all the criteria required for an asset. 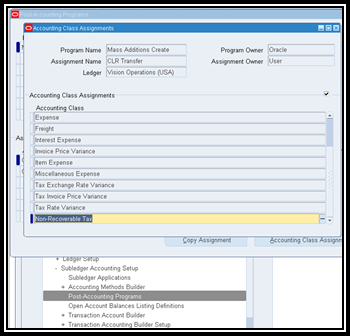 To send non-recoverable tax amounts from AP to FA as part of the asset cost, the Non-Recoverable Tax accounting class assignment must be added to the Oracle Standard Transfer Assignment for the Mass Additions Create Program. 4. Enter a new assignment code and assignment name. Enter a journal if you only want to modify the assignment for one ledger. 6. Insert a row, selecting Non-Recoverable Tax from the LOV. 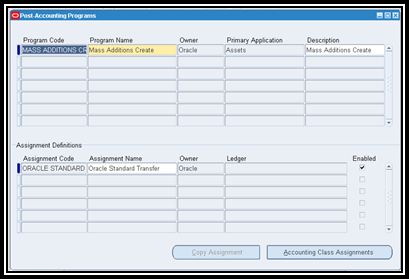 The Mass Additions Create accounting class assignments is seeded by Oracle and cannot be updated. Be sure to enable the assignment definition, and assign it to the appropriate ledger. Tax lines will be transferred into the MERGED queue and can be reviewed in FA in the / Assets / Asset Workbench / Source Lines window. If Public Sector Financials are implemented, an additional process must be run before the Mass Additions Create job, the Update Assets Tracking Flag process (psafatab.pls). This process will set the assets tracking flag to yes on invoice distribution lines in compliance with the GASB 34 and GASB 35. In release 12, the Mass Additions Create process (apmassab.pls) inserts the records into the FA_MASS_ADDITIONS_GT table, a global temporary table. In 11i, it inserted the records directly into the FA_MASS_ADDITIONS table. 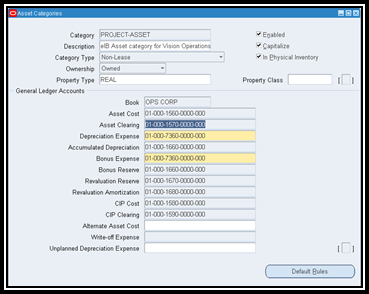 The Mass Additions Create process then calls the fixed assets code, FA_MASSADD_CREATE_PKG (famadcb.pls), which determines whether the selected data meets the criteria to be set moved to the FA_MASS_ADDITIONS table based on the asset book controls and the configured asset and cip clearing accounts. 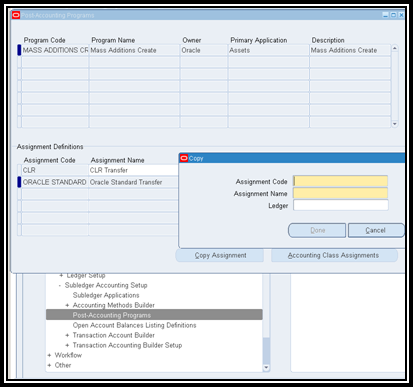 The Mass Additions Create process calls the project accounting procedre PA_MASS_ADDITIONS_PKG (pamassab.pls) code to insert adjustments to projects that were interfaced to AP and insert any discount adjustments to projects. The profile option “FA: Include Nonrecoverable Tax in Mass Addition” is obsolete in R12. See the Non-Recoverable Taxes section to see how to transfer these costs to FA. In 11i, the cost of the asset would be transferred with the tax amount added. In R12, the tax lines will transfer to be MERGED to the item line, and the history of the amounts will be available by reviewing the source lines in FA. 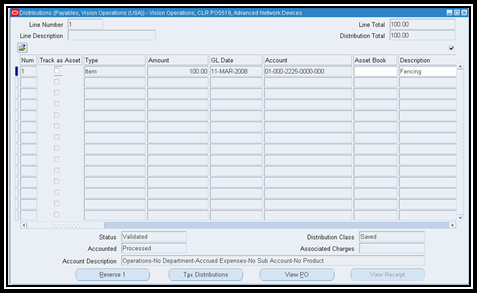 The asset book and asset category can be defined in Payables on the invoice line. These then default down to the invoice distribution. If these are defined in Payables, they will appear in the Mass Additions Prepare screen when the asset is reviewed. They can be left null in payables, and the system will look at the asset clearing accounts and cip clearing accounts setup for the book in FA, and pull the invoice lines charged to an account that is set up for that account. The mass additions create process uses the accounting amount data and accounting class data in the xla tables (xla_ae_headers, xla_ae_lines, and xla_distribution_links) rather than the transaction amounts in the ap_invoice_distribution tables.